So Karbonn has also joined the league of the phone somewhat duplicating Galaxy Note 2, the best part is that they are being sold in the market in a very good amount. Initially it was only the Micromax (with Canvas HD), then Spice (with Stellar Pinnacle) and now slowly other manufacturers are joining the same queue which is giving good number of options for the customers. Galaxy Note which is placed between 35k to 40k INR in the market and in total contradiction these phones offering almost the same hardware specs are placed in the range from 7k to 14k. This phone launched by Karbonn did not make much fuss about its release but yes it is really cheap like the other competitors. The hardware specifications about the phone are mentioned below, these specifications are not available in detail, as you cannot see this product on the official site of Karbonn as of now but it is available to buy from the Spice online shopping store. You can check that from here. Processor has been marked with the Clock Speed of 1GHz, but no idea whether it is Single core or Dual Core. 5MP for primary camera at the back and 0.3 MP of camera in front for video calling, thus helping you with the smooth flow over the EDGE cellular data connection. Internal memory is of 4GB but it can extended upto 32 GB. Equipped with other mandatory requirements like Bluetooth, Wi-Fi, GPS and other sensors. Battery is of 1800 mAh (which is not much for a big screen phone). 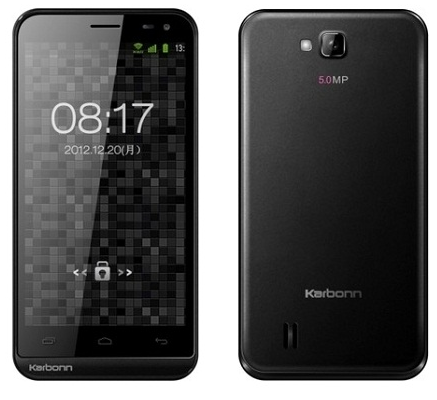 The phone is not up there on the Karbonn website, so not much detail has been mentioned. So, honestly buying this phone right now might be total gamble, it will be better to go for Canvas HD or Stellar Pinnacle instead of this one. It is available at 7,700 INR which is really attractive but again be highly selecting on all the aspects while choosing any of these phones.